Use Configuration Manager conditional access to manage access to Exchange email based on conditions you specify. PCs should be domain-joined or be complaint with the policies set in Intune. Be enrolled with Intune or a domain joined PC. Register the device in Azure Active Directory (this happens automatically when the device is enrolled with Intune (for Exchange Online only). Additionally, the client Exchange ActiveSync ID must be registered with Azure Active Directory (does not apply to Windows and Windows Phone devices connecting to Exchange On-premises). For a domain joined PC, you must set it to automatically register with Azure Active Directory. The Conditional access for PCs section in the Manage access to services article lists the full set of requirements to enable conditional access for PCs. If the device isn't enrolled with Intune, or isn't registered in Azure Active Directory, a message is displayed with instructions about how to install the company portal app, enroll the device, and (for Android and iOS devices), activate email, which associates the device's Exchange ActiveSync ID with the device record in Azure Active Directory. If the device isn't compliant, a message is displayed that directs the user to the Intune web portal where they can find information about the problem and how to remediate it. Setup ADFS claims rules to block non-modern authentication protocols. Detailed instructions are provided in scenario 3 to block all access to Office 365 except browser based applications. If the conditional access policy requirement is to allow domain joined or compliant, a message with instructions about how to enroll the device is displayed. If the PC does not meet either of the requirements, the user will be asked to enroll the device with Intune. If the conditional access policy requirement is set to allow only domain joined windows devices, the device is blocked and a message to contact the IT admin is displayed. Outlook app for iOS and Android, and Outlook desktop 2013 and above is supported for only Exchange Online. The on-premises Exchange connector between Configuration Manager and Exchange is required for conditional access to work. You can configure a conditional access policy for Exchange On-premises from the Configuration Manager console. When you configure a conditional access policy for Exchange Online, you can begin the process in the Configuration Manager console, which launches the Intune console where you can complete the process. In the report parameters, select the Intune group you want to evaluate and, if required, the device platforms to which the policy will apply. For more information about how to run reports, see Reporting in Configuration Manager. Management Channel: The device is managed by Intune, Exchange ActiveSync, or both. Registered with AAD: The device is registered with Azure Active Directory (known as workplace join). Compliant: The device is compliant with any compliance policies you deployed. EAS Activated: iOS and Android devices are required to have their Exchange ActiveSync ID associated with the device registration record in Azure Active Directory. This happens when the user clicks the Activate Email link in the quarantine email. Windows Phone devices always display a value in this column. You can export the contents of the report and use the Email Address column to help you inform users that they will be blocked. You target conditional access policies to different groups or collections of users depending on the policy types. These groups contain the users that will be targeted, or exempt from the policy. When a user is targeted by a policy, each device they use must be compliant in order to access email. For the Exchange Online policy: to Azure Active Directory security user groups. You can configure these groups in the Microsoft 365 admin center, or the Intune account portal. For the Exchange On-premises policy: to Configuration Manager user collections. You can configure these in the Assets and Compliance workspace. If a user is in both, they will be exempt from the policy. Only the groups or collections which are targeted by the conditional access policy are evaluated for Exchange access. Ensure that you have created and deployed a compliance policy to all devices that the Exchange conditional access policy will be targeted to. For details about how to configure the compliance policy, see Manage device compliance policies. 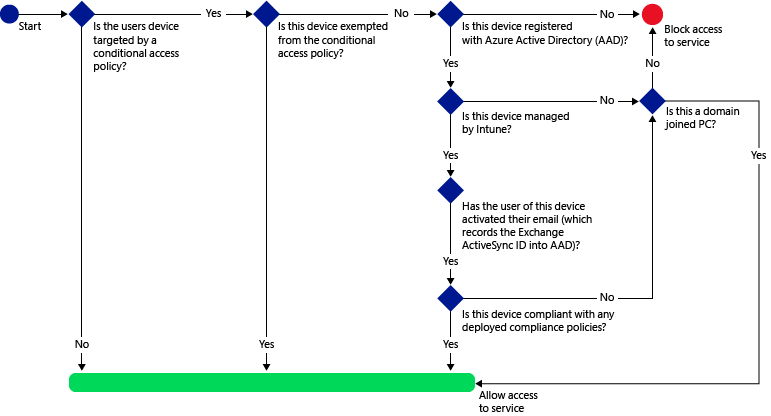 If you haven't deployed a compliance policy and then enable an Exchange conditional access policy, all targeted devices will be allowed access. You can also create conditional access policy in the Azure AD management console. Azure AD management console allows you to create the Intune device conditional access policies (referred to as the device-based conditional access policy in Azure AD) in addition to other conditional access policies like multi-factor authentication. You can also set conditional access policies for third-party Enterprise apps like Salesforce and Box that Azure AD supports. For more details, see How To: Require managed devices for cloud app access with conditional access. 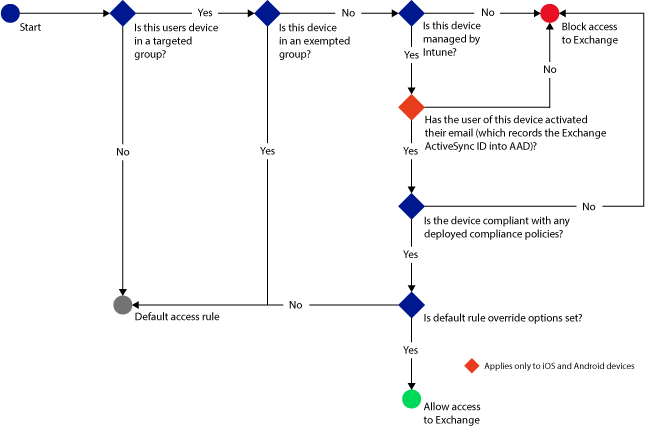 The following flow is used by conditional access policies for Exchange Online to evaluate whether to allow or block devices. Register the device in Azure AD. This happens automatically when the device is enrolled with Intune. For domain joined PCs, you must set it up to automatically register the device with Azure AD. Have activated email, which associates the device's Exchange ActiveSync ID with the device record in Azure Active Directory (applies to iOS and Android devices only). The device state is stored in Azure Active Directory which grants or blocks access to email, based on the evaluated conditions. If the device isn't compliant, a message is displayed that directs the user to the Intune Company Portal website or the Company Portal app where they can find information about the problem and how to remediate it. If the policy is set to require domain join, and the PC isn't domain-joined, a message is displayed to contact the IT admin. If the policy is set to require domain join or compliant, and the PC doesn't meet either requirement, a message is displayed with instructions about how to install the company portal app and enroll. The message is displayed on the device for Exchange Online users and tenants in the new Exchange Online Dedicated environment, and is delivered to the users email inbox for Exchange On-premises and legacy Exchange Online Dedicated devices. Configuration Manager conditional access rules override, allow, block and quarantine rules that are defined in the Exchange Online admin console. 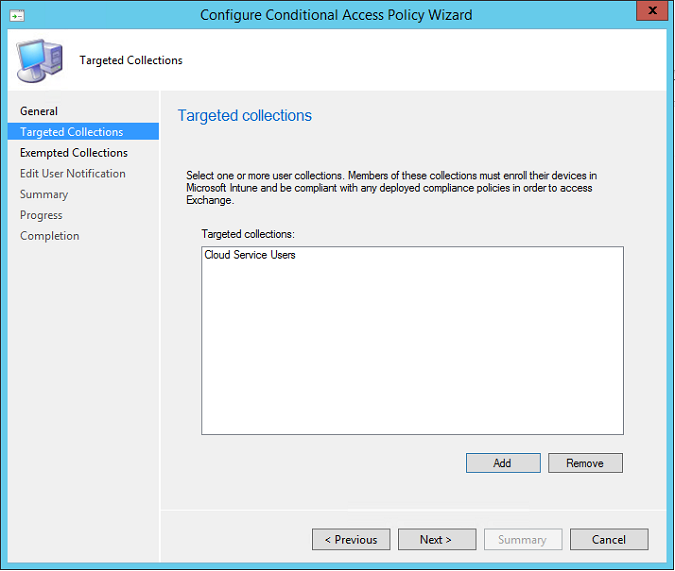 Conditional access policy must be configured in the Intune console. The following steps begin by accessing the Intune console through Configuration Manager. If prompted, sign in using the same credentials that were used to set up the service connection point between Configuration Manager and Intune. In the Configuration Manager console, select Assets and Compliance. Expand Compliance Settings, expand Conditional Access, and then select Exchange Online. On the Home tab, in the Links group, select Configure Conditional Access Policy in the Intune Console. You might need to provide the user name and password of the account used to connect Configuration Manager with any global administrator for the Intune service. The Intune admin console opens. 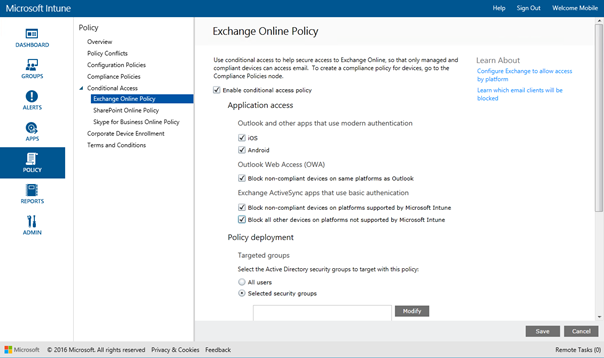 In the Microsoft Intune portal, select Policy > Conditional Access > Exchange Online Policy. 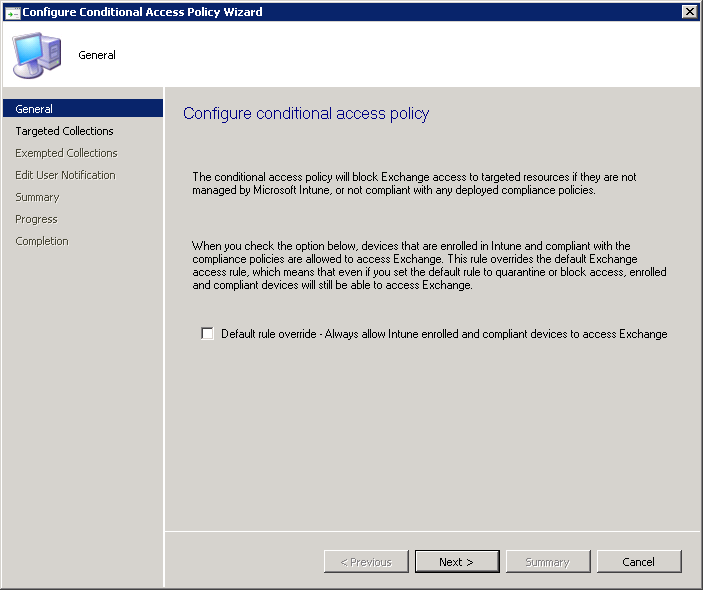 On the Exchange Online Policy page, select Enable conditional access policy for Exchange Online. If you check this, the device must be compliant. If this isn't checked then conditional access isn't applied. If you haven't deployed a compliance policy and then enable the Exchange Online policy, all targeted devices are reported as compliant. Regardless of the compliance state, all users who are targeted by the policy will be required to enroll their devices with Intune. Under Application access, for Outlook and other apps using modern authentication, you can choose to restrict access only to devices that are compliant for each platform. Windows devices must either be domain joined, or be enrolled in Intune and compliant. Modern authentication brings Active Directory Authentication Library (ADAL)-based sign in to Office clients. The ADAL based authentication enables Office clients to engage in browser-based authentication (also known as passive authentication). To authenticate, the user is directed to a sign-in web page. This new sign-in method enables new scenarios such as, conditional access, based on device compliance and whether multi-factor authentication was performed. 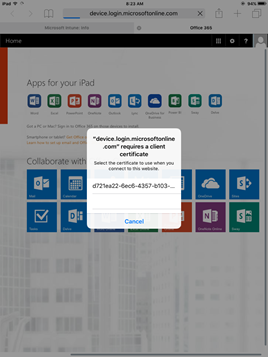 For more information, see How modern authentication works for Office 2013 and Office 2016 client apps. Devices must be domain joined or compliant. PCs must either be domain-joined or compliant with the policies. If a PC doesn't meet either of these requirements, the user is prompted to enroll the device with Intune. Devices must be domain joined. PCs must be domain-joined to access Exchange Online. If a PC isn't domain-joined, access to email is blocked and the user is prompted to contact the IT admin. Devices must be compliant. PCs must be enrolled in Intune and compliant. If a PC isn't enrolled, a message with instructions on how to enroll is displayed. Under Outlook web access (OWA), you can choose to allow access to Exchange Online only through the supported browsers: Safari (iOS), and Chrome (Android). Access from other browsers will be blocked. The same platform restrictions you selected for Application access for Outlook also apply here. Launch the Company Portal app. Go to the Settings page from the triple dots (...) or the hardware menu button. Press the Enable Browser Access button. In the Chrome browser, sign out of Office 365 and restart Chrome. On iOS and Android platforms, to identify the device that's used to access the service, Azure AD will issue a TLS certificate to the device. 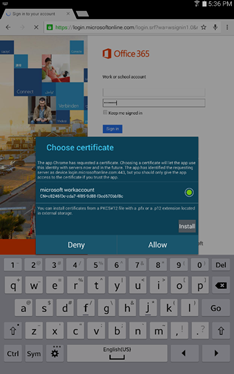 The device displays the certificate with a prompt to the user to select the certificate as seen in the screenshots below. The user must select this certificate before they can continue to use the browser. ForExchange ActiveSync mail apps, you can choose to block email from accessing Exchange Online if the device is noncompliant, and select whether to allow or block access to email when Intune cannot manage the device. Under Targeted Groups, select the Active Directory security groups of users to which the policy will apply. For users that are in the targeted groups, the Intune polices will replace Exchange rules and policies. The user is not licensed for Intune. The user is licensed for Intune, but the user doesn't belong to any security groups targeted in the conditional access policy. Under Exempted Groups, select the Active Directory security groups of users that are exempt from this policy. If a user is in both the targeted and exempted groups, they will be exempt from the policy and will have access to their email. You don't have to deploy the conditional access policy; it takes effect immediately. After a user creates an email account, the device is blocked immediately. If a blocked user enrolls the device with Intune (or remediates noncompliance), email access is unblocked within 2 minutes. If the user un-enrolls their device, email is blocked after about 6 hours. The following flow is used by conditional access policies for Exchange on-premises and tenants in the legacy Exchange Online Dedicated environment to evaluate whether to allow or block devices. Expand Compliance Settings, expand Conditional Access, and then select On-Premises Exchange. On the Home tab, in the On-Premises Exchange group, select Configure Conditional Access Policy. On the General page of the Configure Conditional Access Policy Wizard, specify whether you want to override the Exchange Active Sync default rule. Select this option if you want enrolled and compliant devices to always have access to email, even when the default rule is set to quarantine or block access. There's an issue with the default override for Android devices. If the default access rule of the Exchange server is set to Block and the Exchange conditional access policy is enabled with the default rule override option, then the Android devices of the targeted users may not get unblocked even after the devices are Intune enrolled and compliant. To workaround this issue, set the Exchange default access rule to Quarantine. The device doesn't get access to Exchange by default, and the administrator can get a report from the Exchange server on the list of devices that are being quarantined. If you haven't setup a notification email account when you set up the Exchange connector, you'll see a warning on this page, and the Next button is disabled. Before you can proceed, you must first configure the notification email settings in the Exchange Connector and then come back to the Configure Conditional Access Policy Wizard to complete the process. On the Targeted Collections page, add one or more user collections. In order to access Exchange, users in these collections must enroll their devices with Intune and also be compliant with any compliance policies you deployed. 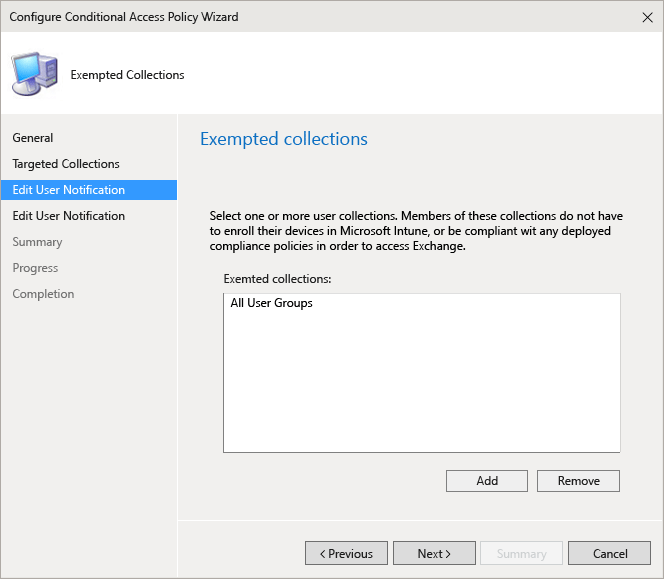 On the Exempted Collections page, add any user collections that you want to be exempt from the conditional access policy. Users in these groups, don't need to enroll their devices with Intune and don't need to be compliant with any deployed compliance policies in order to access Exchange. If a user appears in both the targeted and exempted lists, they will be exempt from the conditional access policy. On the Edit User Notification page, configure the email that Intune sends to users with instructions about how to unblock their device (in addition to the email that Exchange sends). You can edit the default message and use HTML tags to format how the text appears. You can also send an email in advance to your employees notifying them of the upcoming changes and providing them with instructions about enrolling their devices. 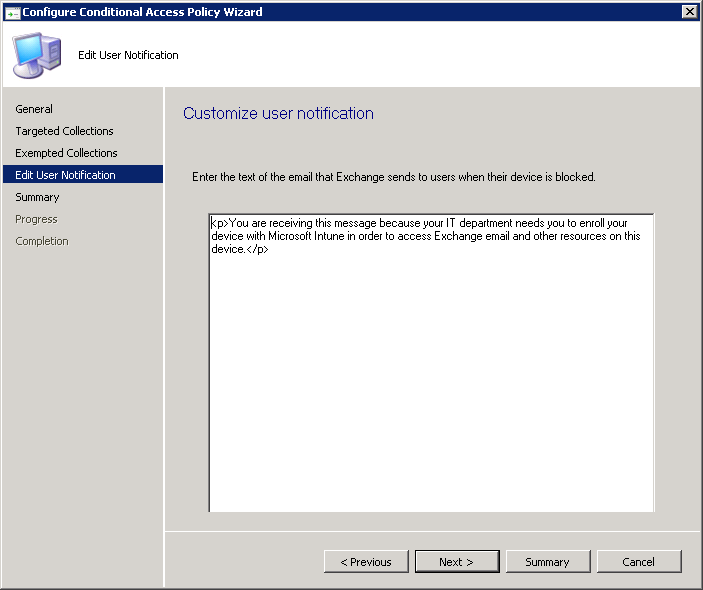 Because the Intune notification email containing remediation instructions is delivered to the user's Exchange mailbox, in the event that the user's device gets blocked before they receive the email message, they can use an unblocked device or other method to access Exchange and view the message. In order for Exchange to send the notification email, configure the account that will be used to send the notification email. You do this when you configure the properties of the Exchange Server connector. For more information, see Manage mobile devices with Configuration Manager and Exchange. On the Summary page, review your settings, and then complete the wizard. You don't have to deploy the conditional access policy, it takes effect immediately. After a user sets up an Exchange ActiveSync profile, it might take one to three hours for the device to be blocked (if it isn't managed by Intune). If a blocked user then enrolls the device with Intune (or remediates noncompliance), email access will be unblocked within two minutes. If the user un-enrolls from Intune it might take one to three hours for the device to be blocked.